When you hear “museum” you probably think of old inventions, not new ones. However, the museum and history centers of Polk County and the City of Lake Wales are among the first in Florida to add a digital dimension to the phrase, “bringing history to life.” With an online app called Florida Stories, the Lake Wales Museum and Cultural Center and the Polk County History Center are inviting tourists and residents to immerse themselves in local history and culture. The Florida Humanities Council first introduced Florida Stories to kick off St. Augustine’s 500th anniversary, but the app’s popularity quickly led to its expansion. Myrtis Young, manager of the Polk County History Center, was among the first to take advantage of the council’s $5,000 grants offered to Florida communities to research and develop interactive tours of their own. “It’s an engaging tool to inspire tourists and residents to experience historical sites right where they happened,” said Young, who also reached out to cities and towns within Polk County to participate. Monica Pierce, director of the Lake Wales Museum and Cultural Center, answered Young’s call, working with the city of Lake Wales to attain the grant. Lake Wales’ 90-minute, 11-site walking tour begins at the Atlantic Coast Line Depot and ends at the Lake Wales City Hall. Along the way, it takes you by the Lake Wales State Bank, which remained a steadfast local institution during the worst points of the Great Depression. Meanwhile, the Polk County History Center’s tour takes you through the City of Bartow with 12 stops spanning about 1.2 miles. 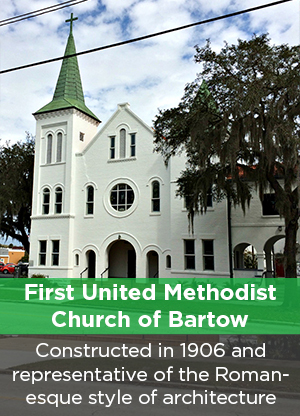 The tour includes longstanding landmarks filled with local history, such as the Historic Oak Hill Cemetery and the First United Methodist Church of Bartow. With the app’s interactive tours—complete with historic photos and immersive sounds—history extends beyond the museum’s walls and reaches right into your pocket, your classroom and to the historical sites themselves. Walking tours are currently available in just six communities, but will soon be available in five more. The Florida Humanities Council is searching for more communities with which to partner, hoping to expand Florida Stories across the Sunshine State. 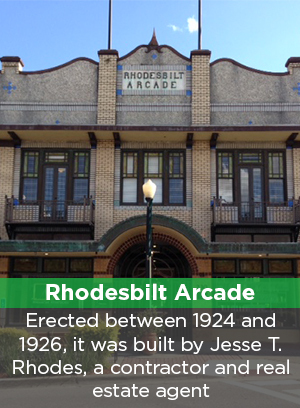 To learn more about local walking tours, click here.